Take it from me, you only feel the pinch of “life” as a fresh grad. With low minimum wages, it’s definitely a hard knock life for a city boy living in Kuala Lumpur. When coupled with rising industry and living standards, things just seem to get even harder. It’s not the way I had imagined kicking off my career. The luxury life I thought I could have aside from the independence and money was something of a far-fetched dream. Well, at least until I found a hack to the system. Yes, ladies and gentleman, I found a way to enjoy life’s sweet goodies with a floor flat monthly income. No, it does not involve, side income from part-time jobs, nor does it include scrimping on daily expenses. Usually magicians don’t reveal their craft but I’ll make an exception this time. Here’s my secret. *Note that I used the Myrapidkl Touch & Go card rates when calculating the expenses. My morning routine begins with a 9am departure from home to a direct bus ride to work. Convenient enough, there is a bus stop located on the main road in front of my neighbourhood, where I patiently wait for bus 652, which route stretches from Awan Besar LRT Station to Pasar Seni LRT Station. Having boarded this bus for over a year, I now know the bus arrives roughly between 9:15am – 9:20am. Upon arrival, I need only to pay a fare of RM1.50 for a 40 minute ride, where I disembark at NU Sentral’s main entrance and walk my way to the office. When work is done at 6:00pm, I walk over to the bus stop at YMCA and wait for the same bus. 652 usually arrives at about 6:20pm – 6:40pm and makes its way to Sri Petaling where I disembark across the road from where my morning bus journey began. Unlike the trip to, the trip back takes over 1 hour due to the horrendous peak hour traffic in Kuala Lumpur. RM15 per week is very affordable but before we jump to conclusions, let us first consider other modes of transportation. Before we delve into the expenses, here’s are some facts to consider. According to PaulTan.org, Perodua recorded the highest total sales in January 2018, topping the likes of Honda, Proton, Toyota and many other familiar brands. In addition, NST stated that their winning product, the Myvi, marked its millionth unit back last May 2017; making it the most produced vehicle in the country and consequently, is the most common car on the road. In short, the Myvi is a very relatable car for fresh grads, costing an average of RM50,000 and running on a full tank of 36 Litres costing an average of RM60 aside from its ease of handling and elegant design. RM102.50 is a lot to cough out in one week and this does not even include the weekend outings yet. While we broach about city-smart travelling, it is only fair to consider the railway but in my case – the LRT. If I were to commute via train along the cheapest route to work, my journey would begin at Sri Petaling LRT Station and end at KL Sentral LRT Station, which would cost RM3.80 per trip with a travelling time of approximately 1 hour 15 minutes having to interchange from the Ampang line to the Kelana Jaya line at Masjid Jamek LRT Station. The trip back is a little faster with high coach frequencies every 3-5 minutes during peak hours and garnering a travel duration of about 1 hour at most. RM38 per week is quite reasonable, one of the reasons why many within the Klang Valley result to them as a means of transportation. Sadly, it used to be cheaper before the MRT developments and the extensions of the LRT lines – such a pity. That’s right folks! I manage to save RM350 per month and that’s a load of cash in fresh grad terms. The numbers don’t lie, and its even clearer with the table above as well. Now if we were to multiply RM350 by 12 months that would mean you would save RM4,200 annually, some numbers to consider if you are looking at purchasing a car or a house in the near future. Of course, there are pros and cons in nearly everything, and it’s no secret that opting for a Rapid KL bus can be infuriating. In the past, Rapid KL buses have been subject to criticism for having ‘Malaysian timing’, poorly maintained and written-off, simply because its a public transportation and the list goes on. But if you possess the tolerance and patience of a monk, none of the cons should pose much of an issue. Don’t worry about waiting times, as once you familiarise yourself with the bus timings you would able to plan your travels more efficiently, and besides, it’s definitely a more relaxing ride when you don’t have to switch lines. So I urge all – especially fresh grads, give it a try and be adventurous. You’ve got nothing to lose and even more to gain from this. Rapid KL buses cover a wide range of areas in the Klang Valley, so a little research will go a long way. You might even find one passing by your neighbourhood. Interstate travels can also be quite pricey if you board a plane. Opt for a bus instead, it’s definitely THE cheaper option. 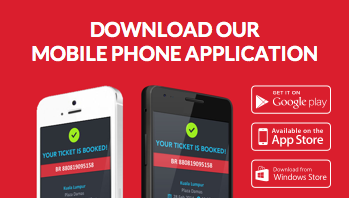 Get your bus tickets easily with CatchThatBus. Visit us at www.catchthatbus.com or download our free app from the App Store and Google Play Store and we’ll take you on your journey!